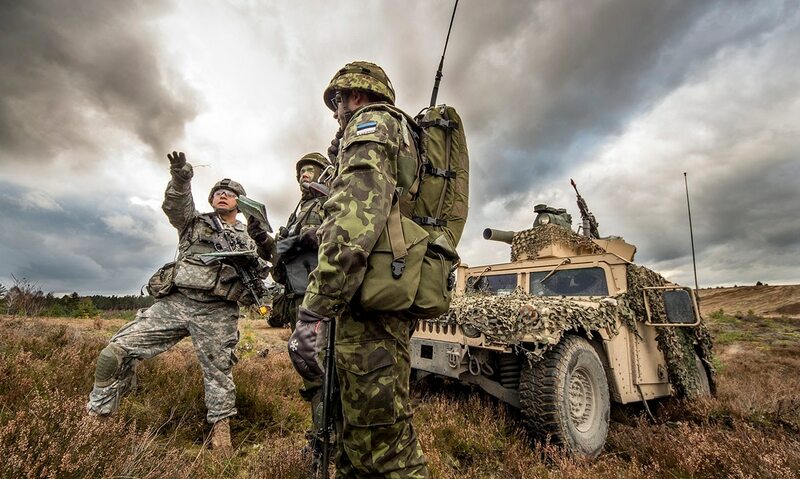 Paratroopers from 173rd Infantry Brigade Combat Team (Airborne), U.S. Army Europe conduct joint training with Estonian army partners during Exercise Steadfast Jazz on Nov. 6, 2013, at Drawsko Pomorskie Training Area, Poland. WASHINGTON — Senior administration officials said discussions of withdrawing U.S. troops from Germany will not be included in next week’s NATO summit, despite reports that President Donald Trump has considered the move. White House officials have pushed back against those reports for the past week, since a Washington Post piece noted that the Pentagon, at Trump’s request, is analyzing the national security impact and cost savings of a large-scale withdrawal of U.S. forces from Europe. About 35,000 American troops are currently stationed in Germany, a significant hub for U.S. military operations worldwide. Trump in the past has repeatedly complained about NATO allies not shouldering enough responsibility — financially and personnel-wise — for the alliance’s security operations. In a press call with reporters on Thursday, U.S. Representative to NATO Kay Bailey Hutchison said that those broader cost concerns would be a key point of the upcoming NATO summit, set to start July 11. Administration officials say the Trump-Putin summit is under control, but lawmakers are worried. Other topics for the summit include the ongoing NATO mission in Afghanistan, extending alliance membership to Georgia and Ukraine, and emerging threats to member countries. But a senior administration official said the issue of U.S. troops in Germany is not on the agenda, and there are no plans for Trump to threaten removing American forces from the country if NATO allies do not continue to step up their own military investments. The official went even further, calling the current U.S. force strength there a key strategic point of American military strategy and national security, and said plans in coming months call for closer relationships among U.S. and Germany military forces, not fewer. Hutchison characterized the tone of the upcoming summit in Brussels as positive — “everyone has the same goal, and that is a strong deterrent and an alliance that is unified” — despite Trump’s past criticisms of NATO. At a South Carolina rally last month, the president said that America is “the piggy bank that (NATO) likes to take from” and promised changes in the relationship in the near future. Hutchison also said that NATO representatives at next week’s summit will discuss Russian aggression in Eastern Europe and other “malign activities” by the country. Trump is scheduled to meet with Russian President Vladimir Putin in the days following the summit. Lawmakers have expressed concern that Trump has not taken an aggressive enough stance with Russia on a host of national security issues.